Cisco(NASDAQ:CSCO) is an American multinational corporation headquartered in San Jose, California, that designs, manufactures, and sells networking equipment. Founded in 1984, the company has a Market Cap of $119.83 billion. It becomes incomprehensible that Technology is taking a quantum leap, especially from last decade. Few of us will be familiar with a nascent term in Technology that is IoE- "Internet of Everything," which brings together people, processes, data, and things to make networked connections more relevant, reliable and valuable than ever before. Each amplifies the capabilities of the other three. It is in the intersection of all these elements that the true power of IoE is realized. Computing Entities will gain context awareness, increased processing power, and greater sensing abilities. Adding people and information into the mix will result in a network of networks, where trillions of connections create unprecedented economic opportunities. 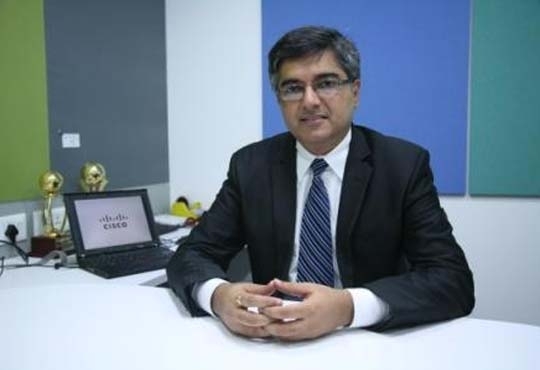 Cisco is focusing more on enabling enterprises on the IoE (Internet of Everything) agenda. It was estimated that in year 2000, there were only about 200 million devices connected to the Internet. With the innovation of mobility, video, social media and Cloud, this number has risen today to an approximate 10 billion and is expected to get a significant upsurge of about 50 billion connected devices by 2020. The remarkable leap is going to start when people, process and data are connected. However, with the advent of a large amount of connected devices, Security is the major concern while working with Cloud computing, hence it is important to accelerate Cloud-as-a-Service in Asia Pacific, Japan and China (APJC). This is seen as a key market from the point of view of working with the Cloud service providers. In developed nations, Cloud is seen as a tool for cost-saving and is probably the most cost efficient method to use, maintain and upgrade. But developing countries like India and China are more upbeat about Cloud's innovative potential. Apart from the innovative potential, the cloud already offers unparalleled Cost efficiency, unlimited storage, easy access to information, quick deployment and many other advantages. The focus is clearly more on increasing business agility, and productivity. As Technology and Business are interlinked, Developing economies are more concerned with the business aspect of Cloud. Catering to these, the corporate IT fields need to ensure rich experience to the end customers from the point of view of infrastructure/or/platform/Software-as-a-Service (SaaS). The Cloud is gaining tremendous momentum in the Indian market and the IT decision makers are expecting a growth of 30 percent in the upcoming future. Better visibility into the work flows is becoming the need of emerging IT. Cloud adoption and the various types of Cloud services such as the Hybrid Cloud, Private Cloud are the buzz words today. Private Cloud is going to be the key driver as it brings 45 percent of Cloud adoption. The private cloud's role will become more impetus as it can help greatly in accelerating innovation, managing large storage requirements and meeting strict security needs. With the advent of cloud adoption, Chief Information Officers (CIOs) will be entrusted with emerging roles and will have to play prudently to facilitate productivity, negotiate complex deals, and manage constituent expectations via close partnerships with Line of Business (LOBs) across all IT consumption lifecycle stages. A term which will define it more profoundly is "A Tiger Deal" which is an agile movement within the organization dealing with intermediate brokers. In fact CIOs' role is actually expanding more than going down. To make sure that all demands are met with appropriate planning, a greater shift is taking place towards centralization, greater control and responsibilities for the CIOs. Corporate houses would have some budget as part of discretionary, non- discretionary spends. Regardless, IT will need to partner with LOBs in complex new ways. In the view of the IT leaders surveyed, IT will evolve to be a broker of services, acting as a critical intermediary and orchestrator of internal and external Cloud solutions within the business while also providing technical support and security.